Create a fantastic gathering space in the dining area in your home with this dining table. Featuring a rectangular table top with slightly tapering legs and a complementary cream stone stripe through the table top, the uniquely designed table is a great addition to your home dining area. Pair this table with the coordinating plush and comfortably upholstered side chairs, as perfect seating accents, and make a space for dining, drinks, and games for family and friends for years to come. The Madrid & Ferrara Dining Table by Rooms Collection One at Rooms Furniture in the Houston, Sugar Land, Katy, Missouri City, Texas area. Product availability may vary. Contact us for the most current availability on this product. Case Detail Clean and sleek edges. 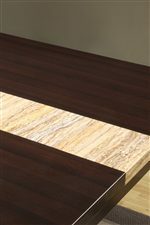 Description: Top Cream stone table top inserts. Outfit your home with functional and sleek furniture found in the Madrid collection. 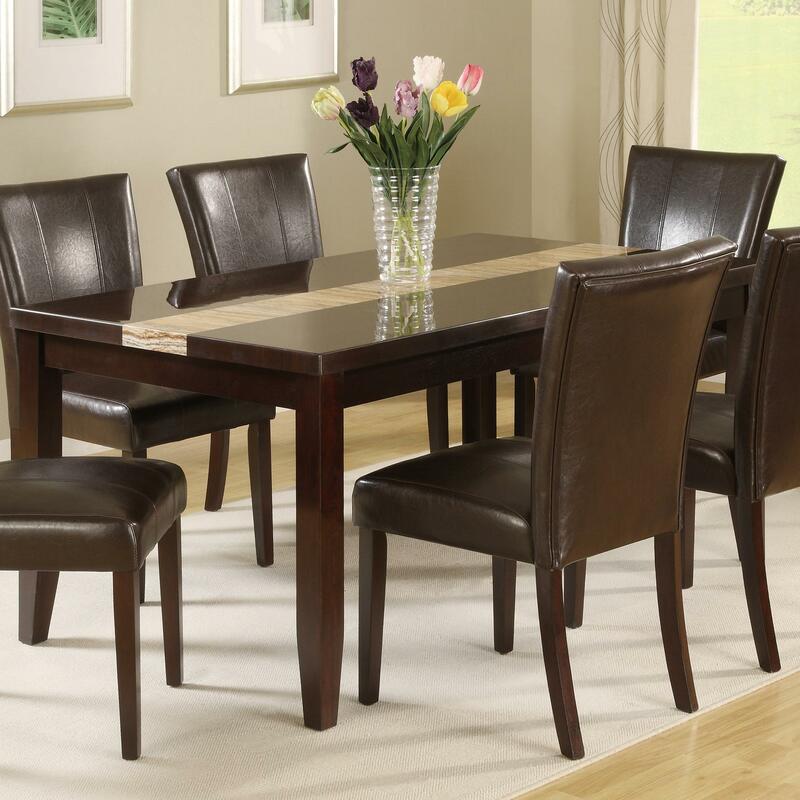 Fresh and modern, with rich brown colors, faux leather upholstered chairs, and stone table accents this grouping is smart and stylish, hip and unique, and makes a smart contribution to your home. The Madrid & Ferrara collection is a great option if you are looking for Contemporary furniture in the Houston, Sugar Land, Katy, Missouri City, Texas area. Browse other items in the Madrid & Ferrara collection from Rooms Furniture in the Houston, Sugar Land, Katy, Missouri City, Texas area.